The World Trade Organization's Sixth Ministerial Conference (MC6) is set to begin today in Hong Kong amid low expectations and high tensions. Police have braced themselves for protests, shops have boarded up windows and the local press has been baying for confrontations, forcing criticism that the mainstream media is fostering a climate of fear. The conference, scheduled to finish Dec. 18, is taking place in the city's iconic Convention and Exhibition Centre. "The Hong Kong government is mustering all its propaganda skills to create a climate of fear as the meeting approaches, to justify cracking down on any dissent and keep the substantive issues off the front pages." Indeed, few details have been provided concerning the failure of the world's richest countries to reduce unfair farm subsidies or tariffs to allow poorer nations access to global markets. Rather, much space has been dedicated to unsubstantiated rumors of gas mask purchases and thefts of security uniforms. The so-called "Doha Round" of trade talks were supposed to reach a landmark agreement this week with the 149 participating nations focusing on reducing trade barriers to help poorer countries. Instead, mainly due to the intransigence of the EU and the U.S., minor deals are desperately being forged in last-ditch efforts to help the world's 48 poorest countries, such as Bangladesh, Mali and Chad. As Institute for International Economics Director C. Fred Bergsten recently noted in Foreign Affairs, virtually everyone agrees that the Doha Round is faltering and may fail. Contrary to expectations, a peaceful parade kicked off events Sunday Dec. 11, attended by approximately 4,000 protesters. It was a festive display of solidarity, more reminiscent of a carnival than a demonstration, with colorful costumes, singing and large cartoon-like sculptures. It also saw Filipinos joined by South Africans, Canadians, Indonesians and South Koreans among others, united in common opposition to the WTO. Han Kyung Ho, a farmer from South Korea, told the South China Morning Post, "There will be no trouble from farmers this week. 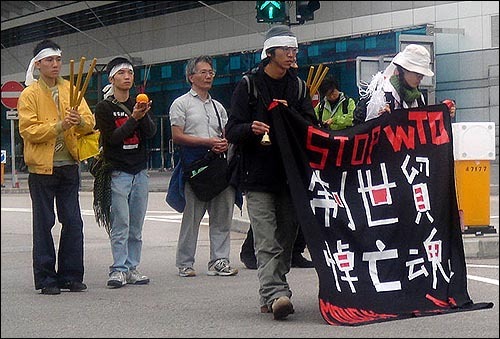 Koreans are peaceful people." 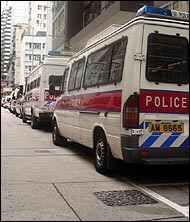 Yesterday, the area surrounding the Convention Center was under heavy security with police out in full force patrolling metal gates and water-filled plastic barriers stretching for blocks around the Wan Chai district on Hong Kong Island. About half a dozen police boats moored in Victoria Harbor directly in front of the Convention Centre. Drain covers have been secured to the ground to prevent anyone from using them as projectiles and protective nets have been placed around footbridges. Secretary for Commerce, Industry and Technology John Tsang Chun-wah warned Sunday, "Our police are well-trained and well-equipped to deal with those who simply wish to disrupt or derail the conference using non-peaceful means."